REVIEW: "A Civil War Christmas: An American Musical Celebration"
While the rest of the city is awash in Nutcrackers and reindeer and Ghosts of Christmas Past, the Huntington Theatre Company is presenting a lovely, if ambitious, alternative for the holidays. 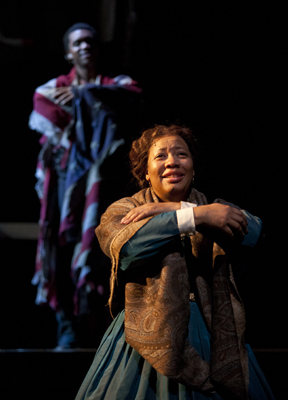 Written by Pulitzer Prize winner Paula Vogel, "A Civil War Christmas: An American Musical Celebration" takes place on one of the coldest Christmas Eve's on record in Washington. D. C. The time is 1864, Abraham Lincoln is in The White House, and war rages on. Directed by Jessica Thebus, the blend of history and fiction begins with the company of actors filing through the audience to assemble on stage. Speaking directly to the audience, they tell us about the story they are about to share. And then, like Victorian actors on a stark stage in the time of, say, Dickens, they begin. The characters range from well known historic figures including Lincoln, Robert E. Lee and Clara Barton, to a trio of men who plot to harm the President, to soldiers and women and children, black and white, desperately trying to make their way through difficult times. Their stories unfold in quick vignettes. Music -- sometimes Christmas carols and sometimes not -- accent the tales, helping to set the tone and remind us of the time. Mary Todd Lincoln fusses about, trying to find a Christmas tree (not then a common fixture) to surprise her husband. Her husband, in turn, fusses over locating the long-ago purchased gloves that he's hidden away for his wife. We meet a young black woman who travels from the South, desperate to see the President. In an attempt to save her daughter from slave catchers, she sends the child on ahead, alone, hoping to reunite with her later. There's a tormented black soldier who mourns for the wife snatched from their front porch. We meet a teenage boy eager to join the battle. And the seamstress who lost her son in the war and now helps out at a home for children. Ken Cheeseman plays Lincoln as less a massive figure from history and more a man who wants to be left alone by his handlers to breath the night air. Karen MacDonald is wonderful as Mary Todd Lincoln, hinting at the hard times to come for the emotionally frail woman who lost a young son and will soon lose a husband. Jacqui Parker (at left) is gripping as seamstress Elizabeth Keckley (and a host of other smaller roles). She beautifully portrays the pain of insurmountable loss against the resolve to go on. As Decatur Bronson, the black soldier who's lost his wife, Gilbert Glenn Brown sketches a man who's working to master a bubbling undercurrent of wrong he cannot right. He delivers a breathtaking version of "The Yellow Rose Of Texas." And as the woman who sets her daughter off alone into the night, Uzo Aduba offers a mother's sense of strength, which she must later call upon when the young girl is lost. The tapestry woven by Vogel is rich. And while the stories tug at your heart, there is also the occasional moment of humor, including having an actor saddled with the role of a horse. If the show has a drawback it's that there's an abundance of material. Too much in fact. So many characters to follow, so many stories to be told, and so much of them offered in snippets. The second act alone could benefit from a solid bit of editing. Scenic design by Dan Ostling and lighting by T. J. Gerckens add tremendously to the feeling Vogel and Thebus are trying to achieve. Standout visuals include the death of Elizabeth Keckley's son as well as a thoughtfully staged snow scene. Music for the production has been arranged and orchestrated by Daryl Waters. At the end of the evening, the journey comes to a close and the community of actors draws close to the edge of the stage for one final carol -- "I Heard The Bells On Christmas Day." The lights dim, the prized Christmas tree magically grows, and the play is over. The Huntington has also secured the services of several choral groups to sing onstage, pre-show, to help set the mood. While the idea is great in theory, the effect on opening night was less than intended. The crowd in the lobby had no idea a group was performing on stage (in this case, an ensemble from Revels). So as they filed in to find their seats, they chatted and waved and pretty much ignored what was happening onstage. They also ignored the Huntington's Managing Director Michael Masso when he took to the stage. The confusing situation was disrespectful to the talented folk who were trying to perform. But the larger question is, should the audience be faulted for not knowing what was going on, or should the Huntington have second-guessed what might happen and planned it differently. Either way, it was uncomfortable for those onstage and a loss for those who were trying to enjoy the pre-show offering. 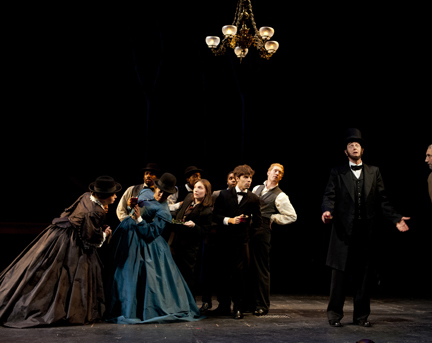 "A Civil War Christmas: An American Musical Celebration" is at the Huntington Theatre through December 13. For information, call 617-266-0800.